Central heating, once considered a luxury, is now an affordable basic requirement in most homes and for the sheer pleasure of its comfort and warmth, solid fuel central heating is unbeatable. 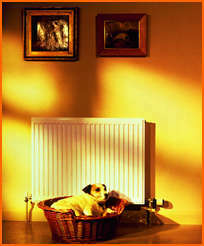 A Brighter Choice - Solid fuel central heating provides all your domestic hot water needs, plus heat for radiators. The system may be run from an open coal fire with a back boiler, a roomheater, a multi-fuel stove, cooker or an independent boiler. There is a system suitable for every home. Efficient Economic Heating - As an example, the running costs of a glass fronted roomheater or stove with full central heating are comparable with alternative fuels. Ease of Control - Controlling the heat output of modern solid fuel appliances is surprisingly easy and, once set, they may be left unattended for long periods. No 'Standing Charge' - Consumers of solid fuel are also in the enviable position of being able to buy exactly how much fuel they want, when they want it without the penalty of a 'standing charge'. Versatility - Radiators can be fitted almost anywhere in the house and are available in a range of styles and sizes to suit your decor. Long, low radiators can be fitted below windows; tall narrow radiators can be installed where space is limited. Some rooms may need double radiators, others just single panel or convector design. All types can be individually controlled by hand adjusted or thermostatically operated valves to keep each room automatically at a constant temperature.